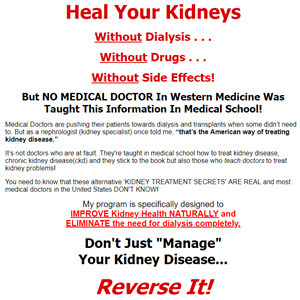 Over 300,000 patients have end-stage renal disease and are currently on dialysis in the United States, and another 300,000 to 400,000 in other countries. (Hundreds of thousands of others who need dialysis in third world countries don't get it for economic reasons.) By 2010 there probably will be about 650,000 patients with ESRD in the United States, if the same rate of increase continues. Some of this increase represents wider availability; but kidney failure also seems to be getting more common. These are the only statistics about the prevalence of kidney disease that have any reliability, and they do not measure prevalence of all cases of kidney failure; they measure the prevalence of end-stage kidney disease only, when dialysis is essential to survival. The prevalence of all cases of kidney disease in the United States can be estimated from large surveys of apparently normal samples of the population, in which a main indicator of kidney function, serum creatinine concentration, is measured in thousands of people. By determining what proportion of people in the sample has elevated creatinine levels and multiplying by an appropriate factor, we can estimate the prevalence nationwide. The disturbing part of this equation is that most people with elevated serum creatinine levels are unaware of the fact. However, it is by no means certain that all of those who have elevated serum creatinine concentrations will go on to manifest chronic renal failure; in some, their serum creatinine level may spontaneously become normal; in others, it may remain slightly elevated but never rise further. For example, according to a recent study of 3,874 patients with elevated serum creatinine concentrations at an urban Veterans Administration center, followed for four years, many do not lose kidney function over time, including more than half of those with only slightly elevated levels and over a third of those with moderately severe kidney failure. It remains to be determined what differentiates those who progress to ESRD from those who do not. In one large series of patients with chronic renal failure known as the Modification of Diet in Renal Disease Study, 15 percent exhibited no progression after being followed for at least two years. Sylvie Rottey and her colleagues in Belgium followed 83 patients with initial serum creatinine levels of 2 to 5 mg per dl for an average of five years. They found that half didn't progress at all during this interval.